Parlez-vous français? Quelle heure est-il ? Où est la salle de bains? There’s a reason that French is considered the language of love, beauty, and romance. You can say virtually anything in French and it will be beautiful. But the French language is more than “just a pretty face.” It’s the official language of 29 countries. It is an official language of the United Nations. And it is one of the most influential languages in history. What is it like to be a French teacher? Students of French can go on to use their skills in international business, international development (being the official language in many West African countries and Haiti), international diplomacy and politics, or simply for a trip to the Eiffel Tower. Whether their love of French is for its beauty or for its practical uses, French teachers pass on to the next generation an appreciation for other cultures and the skills to interact cross-culturally—for business or pleasure. If you’re interested in becoming a French teacher, read on to discover the skills you’ll need, what you’re likely to earn, and the job prospects in this field. Being a French teacher is a challenging but very rewarding career. Teachers have the satisfaction of seeing students grow from not knowing one word of French to being able to converse in a foreign language. Classrooms can be divided by age or by skill level. A teacher might have a class of just one grade, or might have a class with students from the 9th to the 12th grade. French teachers will typically teach several different classes throughout the day, at several different skill levels. In some schools, because of budget, French classes will include a mix of skill levels. Besides having several different classes throughout the day, most teachers also have periods for planning and grading. French teachers will cover a variety of topics in class, from conversational French to grammar to vocabulary to French culture. More advanced French classes often include literature, arts, history, and regional studies. Depending on their theory of teaching, French teachers can use a variety of different methods to teach French, such as memorization, role playing, independent study, or immersion. See the sidebars for a variety of other ideas that can be implemented into your classroom instruction time. Teachers can also get involved in their schools by hosting French clubs, coaching sports, or leading other extra-curricular student activities such as drama. Teachers are responsible for a wide variety of other tasks, including student evaluations, communication with parents, and enforcing classroom rules. Teaching unmotivated students, dealing with behavioral issues, or a heavy grading load can lead to stress and burnout. Many teachers work nights and weekends to get all their grading and lesson planning done. Therefore, a love of students and a passion for their work is critical. Many teachers have summers off and breaks for Thanksgiving, Christmas, and spring break. Other teachers may work on a year-round schedule, with eight weeks on, followed by one week off, and a break for winter. 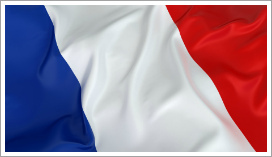 Study the different countries where French is spoken, from Belgium to C’ote D’Ivoire to Haiti. Have students learn some of the typical phrases from those countries. In small groups, have students write and act out their own fairy tales in French. Have a potluck with various French foods in order to teach the names of various food items in French. Watch French films—with or without the subtitles—to help students hear how French is spoken by native speakers. Have students write haikus in French. More advanced students can study French literature and discuss it in French. Abridged versions of classics, such as Victor Hugo’s Les Miserables, are also available for more beginning classes. There is also a need for middle school French teachers, typically teaching the sixth through the eighth grades. Since most middle school students won’t have backgrounds in French, teachers usually focus on the basics during these years. Depending on the school district, French may not be offered to all grades in middle school. Also, arguably even more than at the high school level, students are testing the limits of their newfound freedom. They want to know where the boundaries are, and they’ll regularly try to push those boundaries. Therefore, a healthy sense of humor, a lack of self-importance, and a visible love for your subject and your students will go a long way toward keeping those students engaged and (reasonably) well-behaved—and in turn, keep you from considering other career possibilities. This world will always need teachers, and increased student enrollment will result in more jobs over the next several years. According to the Bureau of Labor Statistics, the number of students per class is likely to decrease, by design; this more personalized approach should result in a need for more teachers. The number of high school teachers is expected to grow by seven percent between 2010 and 2020—a bit slower than overall job growth. Because high school enrollment won’t grow as quickly as elementary and middle school enrollment, there won’t be as high of a need for high school teachers as there will be for elementary and middle school teachers. Jobs for middle school teachers are expected to grow 17 percent in from 2010 to 2020—10 percent more than jobs for high school teachers, as well as 3 percent higher than overall expected job growth across all fields. This job growth is due to increased enrollment as well as declining student-to-teacher ratios. Because of an aging workforce, many teachers are also expected to retire between 2010 and 2020, which will also increase the need for high school teachers. According to the Bureau of Labor Statistics, it is expected there will be more job opportunities for teachers in the South and West, while there will be fewer in the Northeast, and the Midwest will hold steady. There are also expected to be more job opportunities for middle school teachers in urban and rural settings than in suburban schools. New graduates can get experience in teaching and French by getting involved with Teach for America or the Peace Corps. Teach for America enlists recent graduates to teach in low-income communities in the U.S., and is a great both as career experience and life experience. The Peace Corps enables recent college graduates to volunteer around the world, teaching subjects such as English, health, and literacy; French skills can be a big help in many of the countries where volunteers serve. To get experience right out of college, you can also work as a teacher of English as a second language (ESL) in a French-speaking country. French teachers can find jobs in public schools, but can also find employment in private schools, charter schools, or even adult education centers. As of May 2010, the median annual age for high school teachers was $53,230. Middle school teachers make slightly less, with a median income of $51,960. Teachers at either level must have a bachelor’s degree and teacher certification to teach in public school. Many states will require French teachers to have majored in French. Salaries can vary greatly depending on the school district and state. The educational and professional experience of the teacher also makes a big difference. While the lowest 10 percent of teachers earn less than $35,000, the top 10 percent earn more than $83,000. Teachers earning at this level might also have leadership or administrative roles in their schools. Certification requirements for both high school and middle school teachers vary widely from state to state. Also, in some states, middle school teachers are certified to teach both elementary school and middle school; middle school teachers in other states are also certified at the secondary school level, including 7th to 12th grade. Whatever level you wish to teach, you can find out your state’s requirements at teaching-certification.com. Typically, future teachers also enroll in their universities’ teacher preparation programs, which include courses such as pedagogy. Classes will include things such as how to deal with different types of learners and different methods of teaching. In these programs, students also have the opportunity to get experience through student teaching. Private schools don’t have the same requirements as public schools. For example, you don’t need a license to teach in a private school. However, private schools typically hire French teachers with a bachelor degree in French. Whatever level you choose, there are plenty of ways to get started as a French teacher. So pick one, and get started! Assure students that it’s OK to make mistakes. One reason that students might be afraid to speak only in French is that they’re worried they’ll make mistakes. Encourage speaking in French over perfection, so that students become comfortable speaking in front of their classmates. Have safe small groups. Have students work in small groups, speaking in French with a mix of skill levels. This will make the task less intimidating for the less experienced, and can allow those with more experience to help out the others. Appropriate topics. Have students discuss topics that they already have the vocabulary to cover. For example, beginning students will be more able to discuss what hobbies they like than their views on politics! Party Jar. Have a point system or a jar of beans on your desk. Every time a student uses English, take away a point or a bean, or every set amount of time that the class goes without using English, reward them with a point or bean. At the end of the month or semester, if they get enough points or beans, throw a party.